So last week was my dad's birthday and my sister and I worked up a little party to celebrate his many years of life! I originally saw this photo collage on pinterest and wanted to do it for dad. I didn't even know it came from MS at the time! Have I mentioned how much I love her? Anyway, my mom pulled some photos together for me and I took pictures of each one with my phone, converted them all to black and white and added a border, then printed them for the backdrop at our swanky venue. Looking back on dad's pictures, one thing that popped out was his mustache. He's had one my entire life so I thought I would be fun to incorporate the stache into the party decor. Thus, the theme was born. My sister and I made treats for the party. 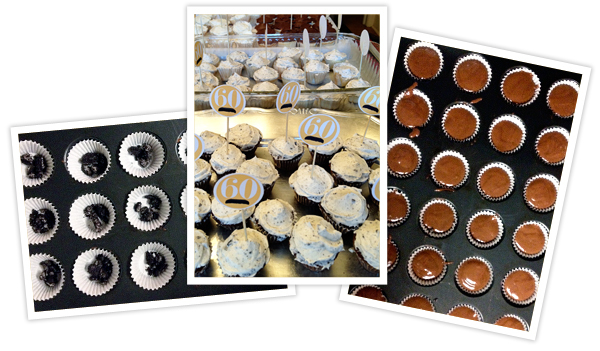 Lots of mini cupcakes came out of my oven and a few didn't make it to the party - a girl has to taste-test. I used Bakerella's cookies and cream icing recipe (with butter, not shortening) and added some crushed Oreo's to a little of the chocolate batter (in a box) as well as the vanilla batter (also from a box). Folks, I may never make a standard cupcake again. Those things were delicious. The cookies even kept their crunch. Anyway, my sister made a variety of fancy treats like peanut butter bites, rolo pretzels and sugar cookies. They were all so tasty. 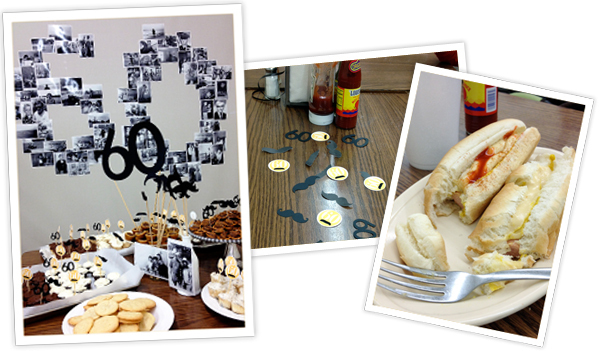 She also cut out mini mustaches and the number 60 so we could top the treats. I think the party table came out pretty cute if I do say so myself! 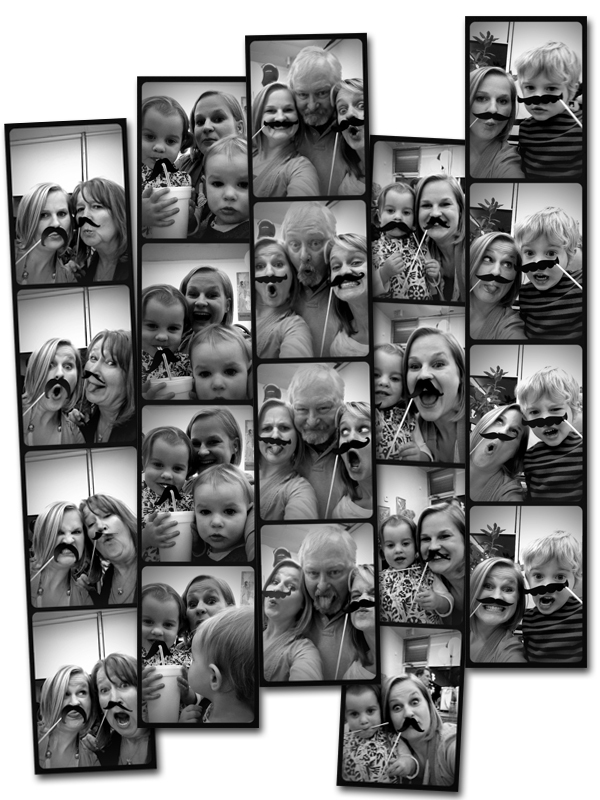 My sister probably got tons of cute party pics so while she was doing her thing, I chased her kids around trying to get them to pose with mustaches with me for a little photo booth fun. 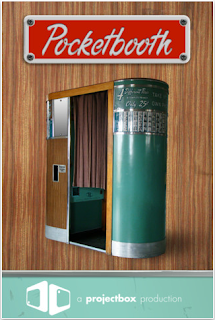 Side note - do you have the pocketbooth app? No!? Go get it now. If you do, you know how much fun that thing is, especially at parties AND parties that have mustaches on sticks! Anyway, here are just a few of the photo booth pics - there's a whole lot more. Oh, and the swanky setting? We had it at none other than Jim's Coney Island. I've mentioned it on this blog before and some know it by "Never on Sunday's" but I basically grew up there. I've even ran into my Dad at Jim's a time or two. It was the perfect setting: laid back, the smell of chili dogs and Greek food and just classy enough to not get stares from the other patrons as we ran around covered in fake mustaches! I hope dad had as much fun at the party than we did planning it! Hilarious! Such a fun idea. Looks like it was a terrific event. Thanks for sharing! I love Jim's! I have to eat there at least once a month. Greek meatballs and chicken oreganato! Oh Ed, I know! That chicken is awesome, not to mention the three-war with squeeze cheese and they have the best gyros in Tulsa, in my own opinion. You guys did a wonderful job in arranging such a lovely party for your dad’s birthday. 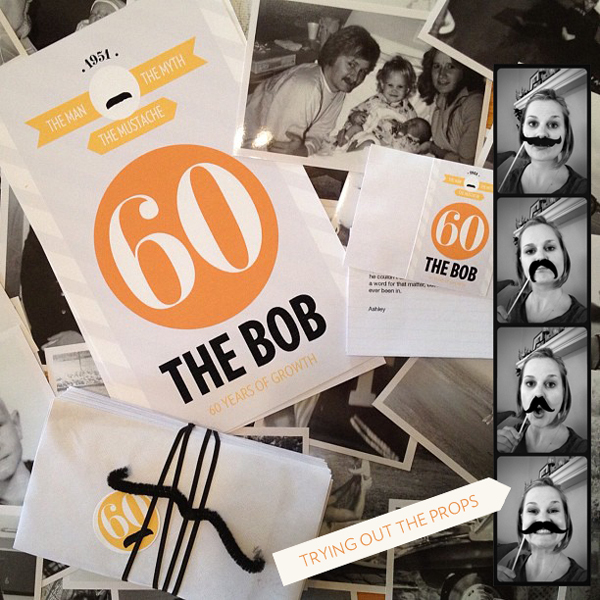 The idea for the theme was amazing and your dad must have been very pleased with the event. We also celebrated my mom’s birthday a few days ago and I had organized an enjoyable party for the occasion at one of the venues in NYC.